GENERATOR 25KW TOWABLE ATLAS COPCO Rentals Ft. Collins CO, Where to Rent GENERATOR 25KW TOWABLE ATLAS COPCO in Ft. Collins, Wellington, Greeley, LaPorte, Loveland, Windsor CO and all of Northern Colorado. 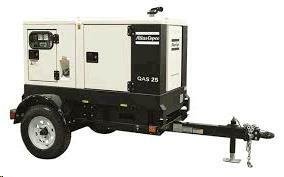 A Towable Diesel powered 25,000 Watt Generator, very quiet. 120V, 240V, & 208V/480V 3 phase, capacity. 2" Ball coupler WEIGHT 2121 LBS. Diesel fuel is extra, tank holds 30 gallons. * Please call us for any questions on our generator 25kw towable atlas copco rentals in Fort Collins, Wellington, Greeley, LaPorte, Loveland, Windsor CO and all of Northern Colorado.